You can post a voice message or interview directly from your iPhone or other smartphone to your WordPress.com blog. If you wanted to share what was happening at an event or simply report from vacation, you have an option. WordPress has a great support page to help you get started with your first Post by Voice. 1. 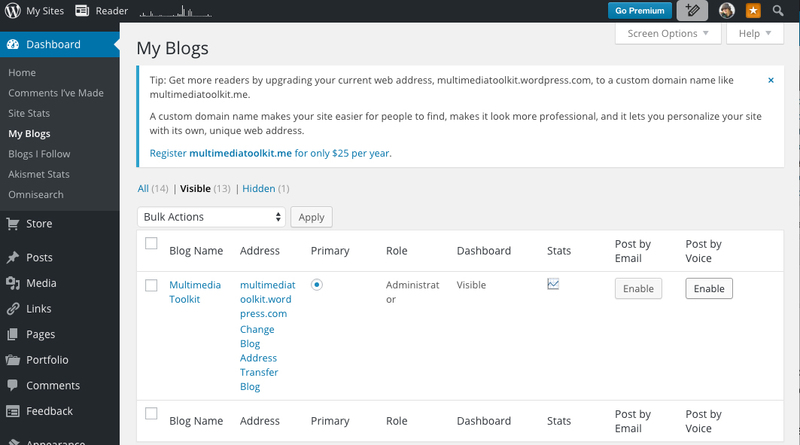 Enable Post by Voice – Go to Dashboard, then My Blogs and select the blog you want use. 2. Select enable and a phone number and secret code will be generated. 3. Call the phone number listed on My Blogs screen and enter the secret code. Note: You can use the Regenerate link to create secret code for security. 4. WordPress will hand the rest! Posted in iPhone, Technology, WordPressTagged iPhone, journalism, Technology, toolkitBookmark the permalink.